Peter is a member of Travelwriters UK and the Outdoor Writers’ Guild, the UK’s best established guild of professional outdoor and travel writers. Since 1994, Peter has written articles on a number of subjects, from travel to history, farming to film-making, for a variety of newspapers including The Times (UK), The Brisbane Sunday Mail (Australia) and The South China Morning Post (Hong Kong), and many magazines and specialist publications including National Geographic: Journeys of a Lifetime, The European Magazine, The Travel Magazine, The Good Property and Holiday Guide, Cruise Magazine, Abroad, Yacht World, Retirement Today, National Geographic: Sacred Places, Taste Anatolia, Emerging Turkey, Current World Archaeology, Archaeological Diggings, Deckchair, Countryman, Yacht Vacations and Charters Magazine, Travel with a Challenge etc. Recently he has had articles published on a variety of topics. Here’s a selection below. As well as travel writing Peter also personally leads a number of our tours in Turkey and gulet cruises each year. A feature using Peter’s 2,000 mile walk across Turkey, retracing Alexander’s route, to explore some of Turkey’s greatest archaeological wonders. A practical and inspirational travel guide to Cappadocia, Turkey. First published in National Geographic’sJourneys of a Lifetime: 500 of the World’s Greatest Trips. The Lycian coast in southern Turkey has one of the most beautiful coastlines – perfect for a sailing vacation. There’s no better way to see it than aboard a gulet. Sailing on the Bosphorus today affords a perfect opportunity to look at the city as sailors would have seen it centuries ago, its seven hills bejewelled with the most splendid mosques. A basic guide to choosing the best archaeological tour for you. First published in the 2006 summer issue of The Travel Magazine. This illustrated feature explaining the planning and ideas behind our escorted archaeology tours and cultural cruises appeared in May 2005 on About.com’s archaeology pages. A travel article about cruising on gulets in Turkey, published in Cruise Magazine (UK), Retirement Today (UK), and Deckchair (Canada). An article by Peter about his latest documentary series, published in the UK in July 2005’s issue of Countryman magazine. A feature published in Retirement Today magazine. A guide to travelling in Alexander the Great’s footsteps. Published in National Geographic’s Journeys of a Lifetime: 500 of the World’s Greatest Trips. A travel guide to a cultural gulet cruise through the Greek islands from Kos to Rhodes. Peter’s photographs have been widely published around the world as part of the publicity for his television programs, and also to illustrate his various travel articles and features. His pictures have been seen in newspapers such as (UK) – The Telegraph, The Guardian, The Times, The Observer, The Express, The Mail on Sunday, and (US) – The New York Times, The Washington Post. They have also been published in specialist magazines such as BBC History Magazine, BBC Wildlife Magazine, Wanderlust, Current World Archaeology etc. Licenses may be granted for the commercial use of Peter Sommer images upon payment of the required fee. Normal fees for editorial uses range from £40/$60 to £150/$225 per image for one-time, one-publication, not-full-page use of an image. Licenses for advertising uses are higher. 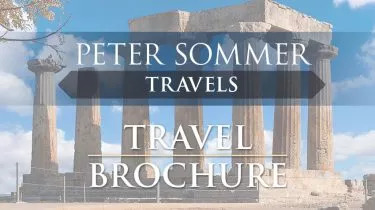 Find out more about Peter Sommer Travels. The extra enjoyment that expert guides like Heinrich and Nota provide is one of the reasons I keep travelling with Peter Sommer Travels. Excellent. This was our second trip booked through Peter Sommer Travels. It is a true pleasure working with them. They have impeccable attention to detail. From the first moment you contact them, they are prompt in responding, all details are carefully covered, and the trip is enchanting.